Although it would have worked just as well in a 25 minute format, this episode does hold itself throughout the 50 minutes. 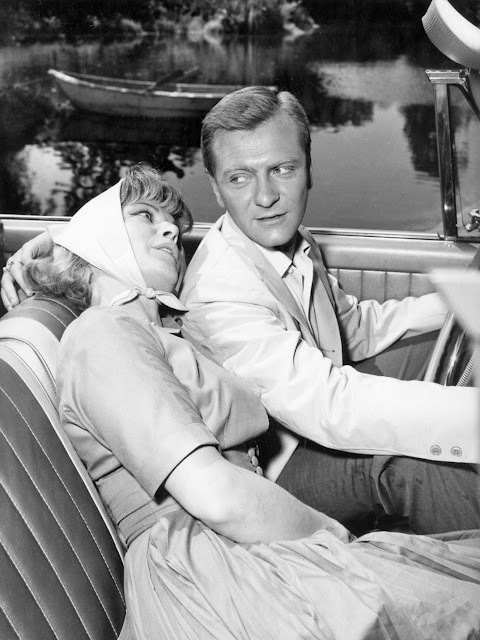 The sprinkling of well-known faces, some who have made multiple appearances through the series, helps to keep the concentration on the episode. I like the way the story pans out. Hearing the phantom knocking on the sonar, to moving above what appears to be a destroyed submarine works well. Obviously being the Twilight Zone, that banging could be anything. Surely not a man still alive some twenty years after the craft had been sunk, but… could it be?... and if not, what the hell is it? Then we have Commander Bell, who goes into sweating hysterics once the craft has been located. But why would he be so affected by the discovery of an old submarine? The story is well crafted, and dealt with the care required to not only give away the ending too early, but also to help build the suspense along the way. Whether or not the ending is to your liking, it does at least give you that twist in deciding which way you like to believe what happened. In Thy Image works well in this universe, with Alan Talbot taking his fiancé Jessica back to his hometown… where nothing is as he remembers it. People who he knew lived there are no longer there, and events that he has recollection of appear not to be in the timestream of the town itself. While it might be a little slow in places, once the crux of the story comes to a head, the twist in the tail becomes apparent, and it is not until the final scene that the whole story resolves itself. While it may leave parts of the mystery without any real resolution or proper explanation, it at least finds its end in its own way. Ahhhh... a Twilight Zone Christmas story. 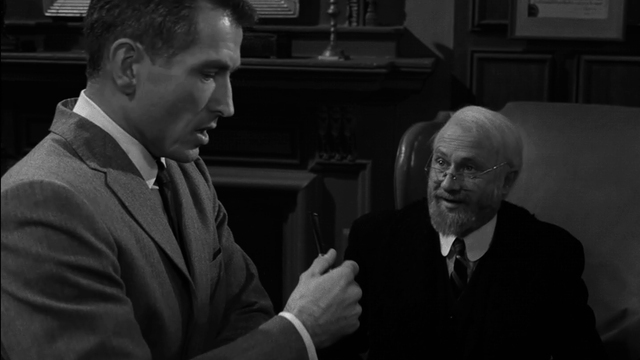 Well, perhaps once again this is a stretch to be a Twilight Zone story again, but it's a nice enough tale, and very sensitively and well acted by Donald Pleasance as Professor Ellis Fowler, a man who has been teaching for fifty years, and has just been informed that he has been effectively forced into retirement. Fowler moves towards a very rushed and inevitable conclusion, but is moved away from this by the sound of the school bell ringing in the distance. 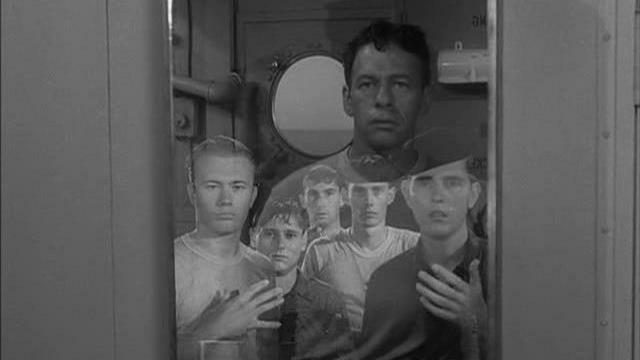 As much as I enjoy this episode, and the way it is written and performed, it is not one I truly consider to be a Twilight Zone. There is no real twist, the story lays itself out as you would expect. But that doesn't make it a bad episode by any stretch. I think Donald Pleasance is just fantastic here, and the mood of the episode is one that holds you in its stead throughout. Rating: A Christmas Carol. 4/5. 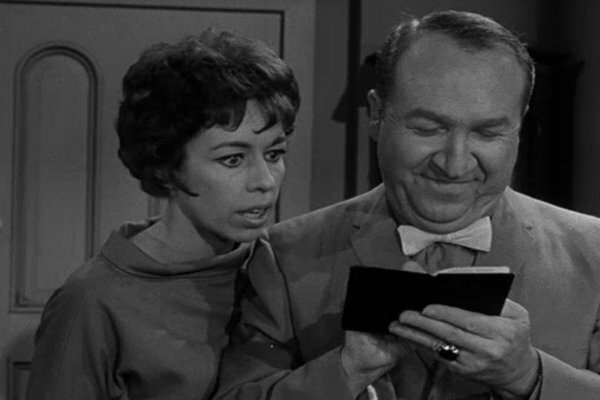 Apart from seeing a very young and demure Carol Burnett doing her stuff, alongside Jessie White as Cavender himself, there's not a lot exciting in this episode. The story of a guardian angel trying to earn his wings, on his final chance to do so, has every opportunity to make the most of the comedic talents of these two actors as well as telling a story that is both warm and humorous. For me, it just doesn't succeed. It's 'nice' enough in its way, but it doesn't really tick the kind of boxes that I think a top shelf Twilight Zone episode has. 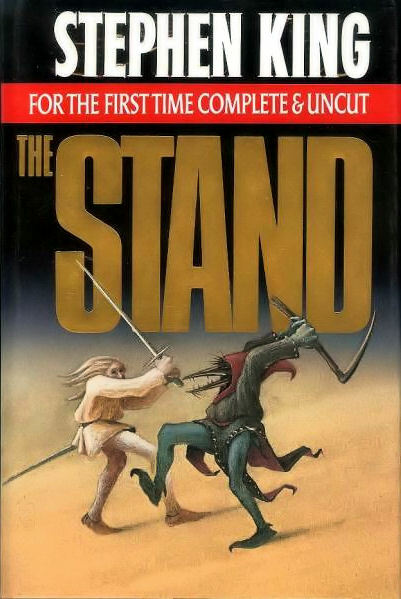 In trying to read, rate and review a book like The Stand, so many factors come into it that it is possible that the end result would be as long as The Stand itself. People’s opinions of this book vary as widely as of any other of Stephen King’s work, most often over the religious (or not) implications as raised in the story, and of the length of the work itself. I have to admit here that I have never read the original book as it was published back in 1978. I have only ever had and read The Complete & Uncut Edition that was released in 1990, which is nearly 400 pages longer than the original published version. In trying to compare the two, I can only go off certain things that King wrote in his introduction of the updated edition, about how it has changed between the two. Certainly the tale of The Kid, with whom the Trashcan Man travelled for part of his journey to Las Vegas, is one of my favourite parts of the book, and the fact that this was not a part of the original makes me believe that the parts of the story that King re-inserted to the updated edition must make it a more enjoyable read – otherwise, why would he have agreed to do it? In any case, as I am again reviewing that updated edition, this must be taken into account. What makes this a very important part of the Stephen King bibliography is that he has written so many characters in this story who all must have their part to play in proceedings, and he has written them all so that whether they are on the side of good or evil or in between, YOU can decide exactly how you feel about them. He hasn’t written heroes for hero’s sake, or villains for evil’s sake. He has written human characters, with their fine attributes and their lesser qualities, but he allows you to decide if you like that person or not. That is a wonderful skill to have as a writer, and I really feel it works to the book’s advantage given that it is a story of good versus evil, but that’s not to say either side contains only one or the other. I do love the opening third of the book, titled “Captain Trips”. Here is described the beginnings of the plague that encompasses the globe (but essentially the United States where the story is set). From the use of Charles D. Campion as Patient Zero, and the ability to escape the clutches of the government long enough to ensure the disease known as Captain Trips is spread to the populous, to his eventual demise in the town of Arnette, Texas and those that witness this demise, the story starts off in a perfect setting. The widening of the net from this point, to not only incorporate long-term major characters in the book and their back story, but those involved in the development of Project Blue and the lengths of which they go to cover up its communicability and 99.4% death rate is excellently established. It nicely expands on the major characters struggle to comprehend what is happening around them and the lengths they go to in order to survive, as well as detailing the nationwide panic that exudes from what is happening and how that is dealt with by all manner of people in all manner of positions. It is an eye opening and thoughtful essay on human existence and how siege mentality may work in such extreme circumstances. The religious connotations surrounding the two protagonists for good and evil, Mother Abigail and Randall Flagg, and all of those affected by these events, makes for an interesting sub plot after the final stages of the plague have dies down. Nick Andros’ comment to Mother Abigail that he ‘doesn’t believe in God’ is met by laughter from her and the reply ‘It don’t matter what you think Nick. He believes in YOU!’ sets out the theme that we are dealing with Old Testament ideas and ideals here, with retribution required in the form of blood. In some ways it doesn’t paint a pretty picture for the Christian faith, and it also tends to ignore other religions in its makeup. But it is a story, a novel, and it isn’t meant to be taken literally though it was by many or most. Those who felt that it was blasphemous were taking things far too seriously. When it came to characters within the book who were changed by the superflu – by which I mean that their own character prior to the outbreak and the way they acted following it – some felt to me as though they had changed quite a lot in such a small period of time that it felt slightly unreal. Again, it’s just a book and the characters are asked by the author to bend to his will when it comes to the story, but those such as Larry Underwood and Harold Lauder in particular seem to be one kind of person one month, and then an almost completely different person a couple of months later. That could be seen to be over-reading the story, and I am happy to cop that if necessary. But that sudden change of character sometimes doesn’t sit well with me sometimes, even though it can be explained away by their natural pull from the good (Larry) and Evil (Harold) aspects of the story, and their part to play in it. Of the others, Stu Redman becomes a leader despite being happy to accede to others back in his hometown, but at least the general build-up of his character allows that to be seen. The drawing of the survivors of the plague to two sides of the protagonists’ views also adds to the second section of the book, entitled “On the Border”. The different ways that the two sides come together and start to rebuild their own society – one through the Free Zone Committee and the other through iron fist – shows a logical divide between the two communities, and also the differences in their priorities and how fast those priorities are moving along. The whole scenario of getting the power back on, the water on, and all of those things we all consider as everyday devices, and how each side of the divide is getting this achieved, is extremely interesting to read, and King doesn’t disappoint in the way he goes about it. Then there is the slow burn build of Nadine and Harold’s involvement of trying to destroy the leaders of the Boulder Free Zone, to throw chaos amongst the people gathered there, and of the disappearance of Mother Abigail throughout this. And then on the other side, of Flagg trying to get his war machine up and running to mount a full scale attack on those in Boulder, even though there appears to be no clear reason why he would want to do this. He just knows that he must, and that is his driving ambition. Okay, so let’s get to it. The character I spoke of earlier, who just doesn’t cut it with me, is Fran Goldsmith. She just annoys the crap out of me, from the first time she is mentioned to the final scene of the book. Her way of fobbing off Jess Ryder when she discovers she is pregnant, the way she appears initially ignorant of Harold’s feelings towards her, the way she carries herself through the journey across the country to Boulder, the way she is in regards to Stu with everything he has to do. I just don’t LIKE her, and this is all the while that she is supposed to be the heroine of the story. Thus, apart from this re-read in which I made sure I read every word, I often skip over the parts of the story that heavily involve her in it. Sure, I’m not a great fan of Nadine either, or other peripheral characters as we go along, but Fran is the one who gets my goat the most. And this is why I say King writes his characters superbly here. Because even though she is set up as Mary to Stu Redman’s Joseph, I dislike her immensely. This for me also somewhat halts the end of the story for me, because to ensure the happier ending, it involved a severely injured Stu having to find a way back to Boulder after he is cast aside by Mother Abigail’s God as the four men made their way to Las Vegas to confront Flagg. This meant using Tom Cullen as his vehicle to get there, through the worst of the winter, and it became a bit much for me to bear as they found their way back and just in time to see Peter born and fight off the superflu virus. But, we must have some closure on that part, so I guess the end justified the means. So apart from these bad tidings, the book as a whole, with every part of it tied together like a perfectly wrapped present, is a triumph. The apocalypse that destroys society, the coming together of the remnants of that society in a mass gathering on two sides of the divide, the fight to rebuild said societies in their masters image, and the brutal confrontation between good and evil, all makes for a cracking read and some thought-provoking material on any number of subjects contained within this lengthy tale.